HELP. PUBLISHER TRYING TO KILL ME. The royalty statement contained all the usual contents (a quick glossary is included below to jog your minds). 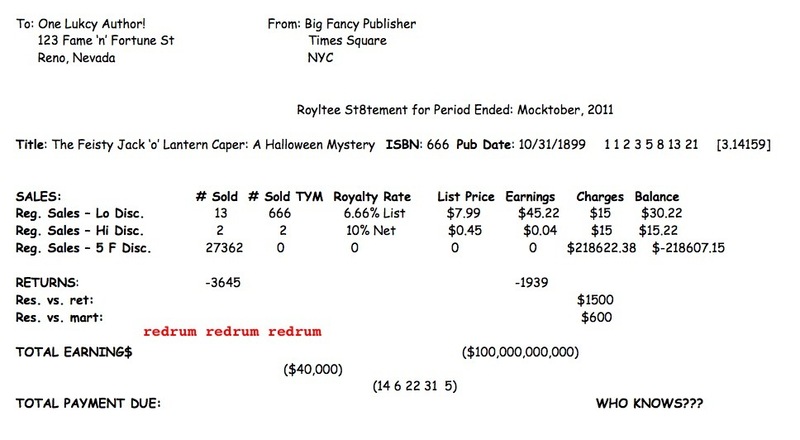 But how to explain the sinister royalty rate of 6.66%? Or the curious use of the number 8 in the word "St8tement?" 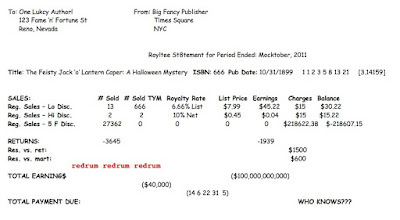 INTERN wanted to believe that this chilling royalty statement was the work of a psychopath...but alas, it was practically indistinguishable from pretty much EVERY royalty statement INTERN has seen, right down to the blood stains. Regular sales – Low Discount: The number of books sold at a "low discount" to bookstores etc. Reserve Against Returns: Amount of $ your publisher is witholding in case bookstores send back unsold boxes of books. Reserve Against Martinis: Amount of $ your publisher is witholding for Happy Hour. Total Copies Sold: The number of books your adoring readership has shelled out for. Total Copies Sold To Your Mom: The number of books your mother has secretly stockpiled in the basement. $100,000,000,000: The amount of money you figured your book would probably make in its first year. $40,000: The amount of money you WOULD be making per year if you had chosen a reasonable profession like teaching or dental hygiene. 1 1 2 3 5 8 13 21: Fibbonaci sequence. 14, 6, 22, 31, 5): Your lucky numbers as revealed by a fortune cookie the accountant was munching on while preparing your royalty statement. Very informative, and I might just use those lucky numbers. You really are so funny, intern. Funny ha ha that is. Thanks for the great and helpful info and for the chuckles, or snickers, as the case may be. So glad you are back on line.